Sony was kind of new to the console market when they released their original PlayStation console. I say “kind of” because the closest they came to launching a console prior was the Super Nintendo CD-ROM add-on/combo unit they were working on with Nintendo. Kind of new to consoles because Sony did work with both Nintendo and Sega to create hardware for other consoles (the Super Nintendo sound chip and the Sega CD sound chip respectively). While Sony had worked on bits of hardware with other companies before, the PlayStation was their first real attempt at their own console and boy did no one see this coming. In the United States we celebrate the birthday of the Sony PlayStation on September 9th. It was released on this day in 1995 and has launched one heck of a storm unto gaming that was COMPLETELY unexpected. 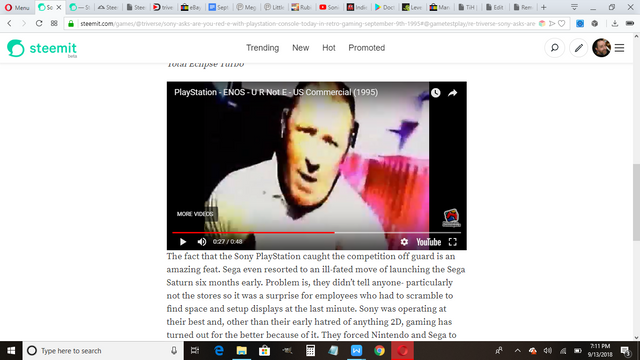 Sony caught Nintendo, Sega, 3DO, Atari, fans, stores, publishers, my dog, developers and more off guard with the success of their debut console. The launch of the PlayStation was not a completely smooth event- anyone remember Polygon Man (double points if you know what region he was actually used in for a short period- like REALLY short). The fact that the Sony PlayStation caught the competition off guard is an amazing feat. Sega even resorted to an ill-fated move of launching the Sega Saturn six months early. Problem is, they didn’t tell anyone- particularly not the stores so it was a surprise for employees who had to scramble to find space and setup displays at the last minute. Sony was operating at their best and, other than their early hatred of anything 2D, gaming has turned out for the better because of it. They forced Nintendo and Sega to up their games and when that happens, the gamer wins. Relive the early glory days of PlayStation via eBay and save some bucks. Good commercial. Needs more screaming faces tho. 0:28 is that Alex Jones? That would be funny if it was. I am sure Sony would be distancing themselves left and right if it was though. Edit to add, it certainly looks a lot like him. I know it is not though, I believe that is one of the higher executives that was in charge of the launch of the PSOne in North America. I remember him because he did a rather cocky interview with Next Generation Magazine back in the day by a pool while wearing a button up shirt and spandex bicycle shorts for some reason. I need to dig that issue out and compare the two though to be sure.